Welcome to Taiwan! 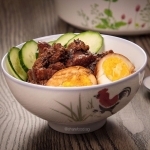 Our dish of the week comes from our mighty mum and Share Food home cook, Low Xiao Qi! Sharing her all time favourite Braised Pork Rice or better known as Lu Ruo Fan in mandarin! The must-have, must-try recipe that is simple and extremely easy to make. The key to this delicious recipe is the sauce! Did you know that the minced pork version is more popular in the southern part of Taiwan while the Pork belly version is more sought after in the northern parts. There were even debates as to whether the original braised pork rice came from China! Who knows? But what matters is that the best there is in Singapore is sold here on Share Food's free mobile app! Satiate that craving and order from Xiao Qi today! Keen to cook it on your own? Here's the full recipe and don't forget to share your photos on our Facebook page!